For this portrait to mark her 90th birthday, The Queen kindly allowed John Bridcut to explore the full extent of her private ciné film collection for the first time. Most of it was shot by The Queen herself or The Duke of Edinburgh, and some by her parents, King George VI and Queen Elizabeth The Queen Mother. 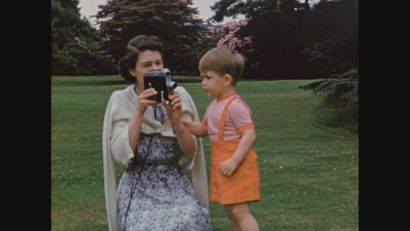 She then generously agreed to be filmed watching some of this footage, and discussing the memories it triggered – along with several other members of the Royal Family. Taking part are The Prince of Wales, The Duke of Cambridge, Prince Harry, The Princess Royal, The Duke of Kent, Princess Alexandra, Lady Sarah Chatto and Mrs Margaret Rhodes. This film, in its extended feature-length version, can now be purchased on DVD for the sale price of £8.50 on this website. 'Let’s be honest, some royal documentaries are better than others, and over the last few decades there have been occasions when watching could feel more of a duty than a pleasure. Happily Elizabeth at 90 – A Family Tribute was a triumph from start to finish. I cannot recall ever seeing a more charming, warm and – dare I say ­– human portrait of the Queen than this one lovingly pieced together from the Royal family’s own private archive of film taken over the last 90 years. '“The entire collection [of film]”, said Prince Charles, “provides a wonderful insight into my Mama’s long life”. It certainly did, especially when spliced together so skilfully by director John Bridcut, whose selection was nothing short of superb. […] That was the beauty of this film. For once, it succeeded in blurring the boundary between public formality and private emotion as we saw warm smiles and flashes of delighted recognition flicker across the faces of the Queen, Princess Anne, the Duke of Kent and others at seeing happy past times. 'The structure of the documentary was akin to a bran tub at a school fete but every dip pulled out a prize. It was also Gogglebox. The commentary of the sofa-sitters before the flickering screens made it. For a family publicly susceptible to permafrost, the old movies cut an awful lot of ice and revealed an awful lot of character…. This DVD is producer John Bridcut's 2nd mining of the Royal Family's home movie collection to celebrate the Queen's 90th birthday - the previous being to celebrate her Diamond Jubilee in 2012. The images are of the private life of the royals and, uniquely, this time the Queen herself is providing narrative of past, happy times. The DVD reinforces the sense of the first one in that, behind the scenes, the royals share family life and values similar to those of their subjects. Other members of the family watch clips and comment on them, but the most compelling in my view was the reaction of Lady Sarah Chatto niece to the Queen, being the daughter of Princess Margaret. The wee girl looked as though she had the weight of the world on her shoulders, but as the grainy clips of the sisters flickered across the screen her whole face lit up with pure joy at the sisters closeness depicted in the home movies. Clearly, the girl still misses her Mum. Although the nearest most of us will get to the Queen is handling coin of the realm, this DVD provides evidence that were they to nip round for a cup of tea or borrow some sugar, we would have more in common than might be supposed from the tabloids headlines. Loved it.